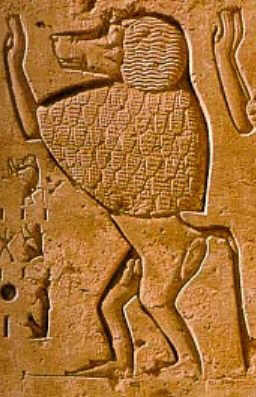 Hedjwer was the earliest Egyptian baboon sun god dating back to the early Dynastic period in Upper Egypt. Hedjwer was a solar deity and represented as a baboon as these primates chatter and screech at sunrise and warm themselves in the early morning sun. The ancient Egyptians were wary of baboons as they exhibited many human characteristics including strange chattering sounds. They believed that the baboons were singing to the sun god and that they were the first to pay proper religious observances. The ancient Egyptians were wary of baboons as they exhibited many human characteristics including strange chattering sounds. 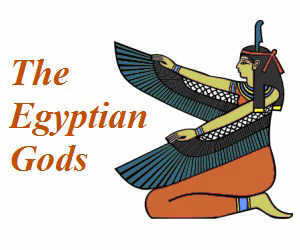 It was believed by the earliest Egyptians that they were the reincarnations of deceased ancestors and therefore sacred. Hedjwer, the first baboon god, embodied royal ancestors and the earliest pharaohs linked themselves to the glorious deeds of their forbears as indicated in their serekh, the hieroglyph used to convey the name of the pharaoh. The serekh of Narmer (founder of the First Dynasty) also represented Hedjwer. 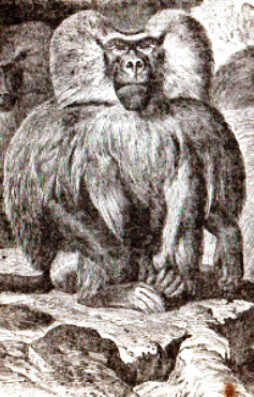 Baboons were often portrayed in art with their arms raised in worship of the sun and are connected to Divine Consciousness. The baboon god was also depicted holding the Wadjet or “udjat” (the Eye of Horus, the All-seeing Eye, the Eye of Ra) and was one of the most potent symbols of ancient Egypt symbolizing restoration, protection and sacrifice. The following facts and profile provides a fast overview of Hedjwer. Titles: The "Great White One", the "Great White", "Bull of Stars", "Head of Hermopolis"
The city of Hermopolis (Khnum) was an important religious center in ancient Egypt and was the cult center of Hedjer during the Early Dynastic Period and the Old Kingdom. During the during the middle period of the Old Kingdom a fierce, Virility baboon god called Baba, or Babi, emerged who was also represented as a baboon god. Baba was a fierce god and closely associated with the Underworld. The city of Hermopolis became the cult center of the famous god Thoth in the Late Period 664–332 BCE. 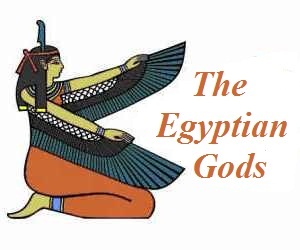 Many of the gods of the ancient Egyptians were subsumed (meaning absorbed) into new deities. The practice of creating new deities, by combining them with the attributes of old gods, is called 'syncretism'. It is possible that this was the case with Hedjwer, Baba and then Thoth. In ancient Egyptian mythology Thoth is connected with baboons but it is unclear that Thoth the god was actually represented as a baboon, as most would suggest. Given the history of Hermopolis and its strong association with baboon gods it seems logical that the tradition continued, by connecting Thoth with the baboon. Depictions of baboons with Thoth place baboons in a 'helper' or subsidiary role. 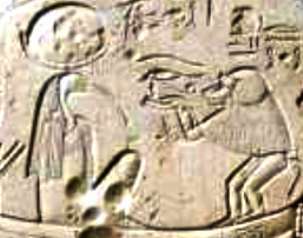 The baboon connections to Thoth and the Underworld appear to relate to Baba. Currently there is a small open air museum at Hermopolis (Khnum) in which there are two massive statues of a baboon god worshipping the sun in the guise of a 'dog faced baboon' (Papio hamadryas). It is believed that other baboon statues guarded the procession way that led to the Temple of Thoth. The processional road to the Temple of Amun in ancient Thebes (now Luxor) was similarly flanked with ram headed lion sphinxes. Discover interesting information and research facts about Hedjwer, the Egyptian sun goddess of war. The facts about Hedjwer provides a list detailing fascinating additional info to increase your knowledge about Hedjwer in Egyptian Mythology. Fact 4: Baboons were popular in Egypt, and sometimes kept as pets. Tomb scenes show the animal led on a leash, or playing with the children of the household. Fact 6: The yellow baboon, Papio cynocephalus is a baboon in the family of old World monkeys. literally means "dog-head" in Greek, due to the shape of its muzzle and head.